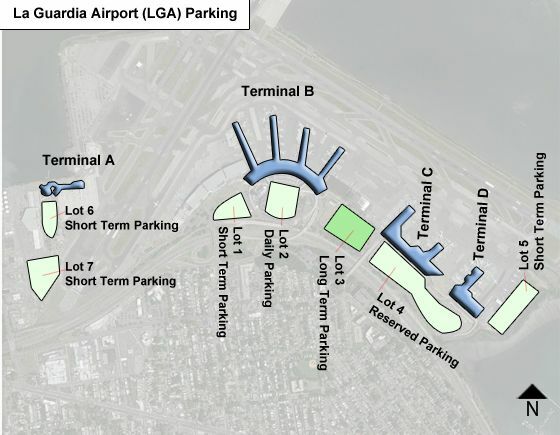 Passenger Drop-off and Pick-up: No parking in front of or next to any of the terminals, otherwise cars will be ticketed and towed at the owner's expense. It is recommend that you park car in either a short-term lot when dropping off or picking up a passenger. You are allowed to enter the terminal with the passenger and enjoy any areas before security, however, you cannot go past the security checkpoint. daily max (24 hrs) - $30. After 48 hrs: $5 for each 8-hr period or part thereafter. First 24 hrs period: $3 for the first half hr, up to one hr $6, each hr thereafter $3, up to $15 max. Payment Method: by cash (U.S. currency), check (in U.S. currency), American Express, MasterCard, Visa, Diners Club, Carte Blance and Discover cards are accepted for payment of parking fees. E-ZPass is a faster way to pay for your airport parking - accepted in all lots. Take the free Route A (All Terminals) or Route B (All Terminals Except for Marine Air Terminal / Delta Shuttle) courtesy buses to transfer between Parking Lots and Terminals. Route A buses run every 10-15 minutes from 4:00 a.m. to 11:30 p.m. and Route B buses run every 10 - 15 minutes from 6:00 a.m. to 2:00 a.m.
Meeting traveler at Terminal B, where should we park?